Shortly after the 2012 MIT Mystery Hunt, the 1994 Hunt was added to the archives. Previously, only a small portion of this Hunt had been archived. Like the 1996 hunt, it was posted without any solutions, save solutions for those few puzzles which had long been there. After we finished solving the 1996 Hunt as well as we could, we tackled the 1994 Hunt. In this case, the archives showed the complete solution to the final runaround and the list of answers to the other puzzles which went into it. It did not, however, say which one went with which other puzzle, nor how those answers are arrived at. We did our best. The hunt's instructions tell us that each puzzle has a two-part answer. One of the parts is a word that can go before one of the placeholder words in the runaround instructions, and the other part should replace that word in the instructions. 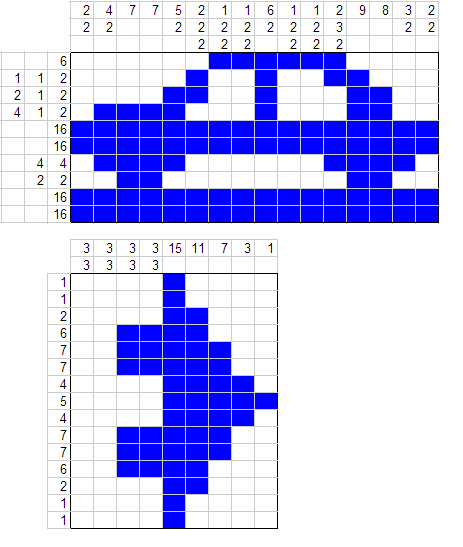 The solution for the crossword is already posted on the MIT web site. Per the instructions, the last column contains the answer we need, SHORT = TEN. We don't have the metal key used for this puzzle. The Hunt web site says you had to identify the letter of the drill bit which made each hole in it. Whatever was available by telnetting to the server indicated is long gone. We don't know what it was. The answer to this puzzle is already posted on the MIT web site. The answer is BACK = END. The answer is spelled out along the only column used in each word: DATE = NEW SALEM. The answers to the questions in the first part are CO, AIR, KLM, GQ, TUX, NJ, VHF, WZ, SPY. In the second part, they are UPS, BQ, ZAX, MO, FW, KDL, JVC, YEN. Each answer appears in left to right order among the other letters in its corresponding scrambled alphabet. Removing these letters leaves BED in the first alphabet and RIGHT in the second, which are the answers. The indicated letters spell the answer, RAG = NORTH. The paint-by-numbers puzzles lead to the following solutions, a picture of a CAR and the arrow shape in the negative space between the E and X of an EXIT sign. The acrostic of these answers gives the final answer: AIR MEANS ON THE FAR SIDE OF THIS CORRIDOR. And per the instructions, their last letters spell the answer, CON = LEFT. The solution for this puzzle is already posted on the MIT web site, giving the answer WIND = PANE. The atomic symbols of cobalt, radon, and erbium spell CORNER, and the melting point of lithium is 180 DEGREES. The solution to this puzzle is already posted on the MIT web site, giving the answer BASE = BOSTON. The 4-digit numbers given should each be broken into two 2-digit blocks. 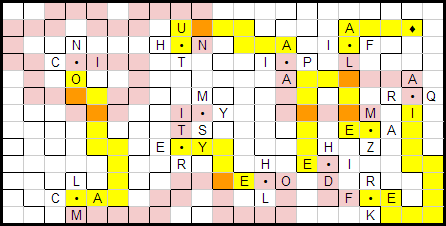 Each resulting pair of numbers gives the X and Y coordinates of a pixel to illuminate to spell the answer, SOFT = T.
In the crossword, each theme entry needs to drop the letter sequence EAR one or two times (not necessarily near the highlighted letters) to fit into the grid. The first answer is the missing word EAR. The second answer is spelled by the letters in the shaded squares, in the order of their numebrs, spelling ON THE RIGHT. The criss-cross has an error. The given letter R should actually be one square lower, as should the shaded square above it. The shaded letters, in clockwise order, spell the first answer BRAIN. Across: 1. CHI + EF. 5. HEART anag. 6. initials (Nurses Are The Attendants Legitimately) 7. TOT + EM 8. FED reversed + GO reversed (somewhat irregular wordplay) 9. DANGERS - DS anag. 10. CA(C)T + I 11. hidden in raiNY LONdon. Down: 1. ACID anag. in CANDY 2. REINFECT A anag. 3. RATE + RNA in FL (Florida) 4. CLONE ME HA anag. Per the instructions, the letters in the two unclued words can be anagrammed to spell the final answers, RING = LEFT. The first group of transadditional forms world capitals: CONA(K)RY, ALGI(E)RS, NIAME(Y). The second group of transadditions forms countries: GAM(B)IA, SING(A)PORE, (S)YRIA, S(E)NEGAL, DEN(M)ARK, SW(E)DEN, IRELA(N)D, (T)OGO. The added letters spell the answers, KEY = BASEMENT. The first several are just examples to give you the right idea. The answer is hidden only in the last two phrases, SKY = EAST. We obviously could not solve the scavenger hunt, but the only four-word answer not used in another puzzle is HAND = OVERHEAD LIGHT FIXTURE. The letters in the numbered squares, in numerical order, spell the answer FIRE = WEST. The riddle gives the first part of the answer, FREE, clued several times over by means of words that form compound words or phrases with free (freeway, freestyle, carefree, freeload, freehand, pain-free, free lunch). In the logic problem about house numbers, Cajix must have a square house number, or else Alice would have more than two possibilities for his house number regardless of what she believed about Bob. Since its squareness, and that Cajix's house number is more than Bob's, are the only things she knows about Cajix's house number, her two possibilities for Cajix's house number must be 49 and 64. Therefore, Alice must believe Bob has a house number less than 49, but at least 36. Since her conclusion was wrong, she didn't get to this conclusion because her own house number forced Bob's to be 36 or more. Therefore, she must have wrongly believed Bob's house number was a multiple of 23, and her own house number was at least 23, forcing her to believe Bob's house number was 46. Since she came to a wrong conclusion, Bob's actual house number must be less than 36, and Cajix's actual house number must be 36, since if it was 25, there is not enough room for the difference-of-4 clue to be true. Alice's house number must be at least 8 less than Cajix's, so Alice's house number is between 23 and 28 (inclusive), and Bob's is between 27 and 32. Bob has an exact guess for Alice's house number based only on his incorrect belief that it is a cube. This means Bob must think Alice lives in house 8, which means Bob himself lives in house 27. Therefore, Alice lives in house 23. To confirm the last part of the clue, Cajix also wrongly believes Bob lives in a multiple-of-23 house and Alice lives in a cube house, producing the results 23 and 8, respectively. Then 3(23) + 3(27) + 36 = 158 for the second part of the answer. Since U-N = 17, N is at most 9. Since IIIIIN=40, N is a multiple of 5. Hence N = 5, I = 7, and U = 22. From BUN=37, B = 10. From NO=22, O = 17. From IINNK-B = 15, K = 1. From BIKG = 32, G = 14. From UGE = 62, E = 26. From BLUE = 73, L = 15. From PLUM = 55, M = 2. From MAGE = 67, A = 25. From R - M = 11, R = 13. From CREAM = 75, C = 9. From RED = 45, D = 6. From TAN = 54, T = 24. From BRW = 27, W = 4. From WHITE = 81, H = 20. From BUFF = 54, F = 11. From YELLOW = 95, Y=18. From JADE = 78, J = 21. From AQUA = 75, Q = 3. From VIOLET = 112, V = 23. From FLAX = 63, X = 12. From BRONZE = 90, Z = 19. By elimination, S = 8. The final clue 6789 = SPECTRUM is interpreted by taking the letters representing 6, 7, 8, and 9, which spell DISC, as the first part of the answer, and the sum of the values of SPECTRUM, or 120, as the second part. The dice have the letters AKNOUW, BCDEHI, FGMTXY, JLPRSV. Extracting and ordering the indicated letters spells the first part of the answer, SOME. 0123456789 = OYTFREVUIN, but what we need is EI = 58. Most of this is just filler. The answer is at the end, NIGHT = BLACK. Break the text into groups of three letters and reverse each group. It spells I COULDN'T MAKE ALL OF THEM TOO HARD OR YOU'D GIVE UP RIGHT AWAY SO HERE'S AN EASY PAIR. SUN IS THE FIRST WORD AND BLAST FURNACE IS THE OTHER. So SUN = BLAST FURNACE. This is Braille, with 0s for dots. The answers are RAP and ACROSS THE HALL. The answer to this puzzle is already posted on the MIT web site. The answer is HORSE = DOWN. The knight's tour can be solved to spell THE WHITE OF CHRISTMAS EQUALS CONSERVATIVE WING, meaning SNOW = RIGHT. The solution to the maze is shown. Yellow sections are walking on the paths, pink sections walk through walls, and orange sections are where you pass the same square once each way. The letters you cross after each circle spell the answer, LIFE = MANOMET. The initial letters of the titles spell the answer, BARN = SOUTH. The answer to this puzzle is already posted on the MIT web site. Instead of giving you another pair, this one gives you an instruction: If two steps of the path begin with the same word they must be interchanged before you start. The answer to this puzzle is already posted on the MIT web site.